For Wairarapa’s suicide prevention co-ordinator, the word “hope” means her heart is still beating. The word has such profound meaning to her that she legally changed her last name to Hope to celebrate surviving her own mental health battles. In September, “hope” will take on a special meaning for other Wairarapa people, with the inaugural Hope Walk being held in Masterton and Featherston on September 9. Suicide prevention co-ordinator Rachel Hope said the theme of the day was “working together to prevent suicide” – mirroring the theme of International Suicide Awareness Day (September 10). It’s not the only event designed to raise awareness of mental health and suicide in Wairarapa – a sign that Rachel says shows that the community is taking ownership of a challenge often ignored. Provisional suicide statistics, released last week by the coroner’s office, show there were eight suicides recorded in Wairarapa during the year ending June, down from 12 the previous year. Rachel said while an improvement was good, the statistics were still “heart-breaking”. “While that’s vaguely encouraging we are doing something right . . . I’d love for it to say zero under Wairarapa,” she said. The Hope Walk is one of many upcoming events organised by the community to raise awareness of suicide and show support for people in Wairarapa living with mental illness, or those who have been bereaved by suicide. Other events include a tattoo fundraiser, boxing, and a film screening. 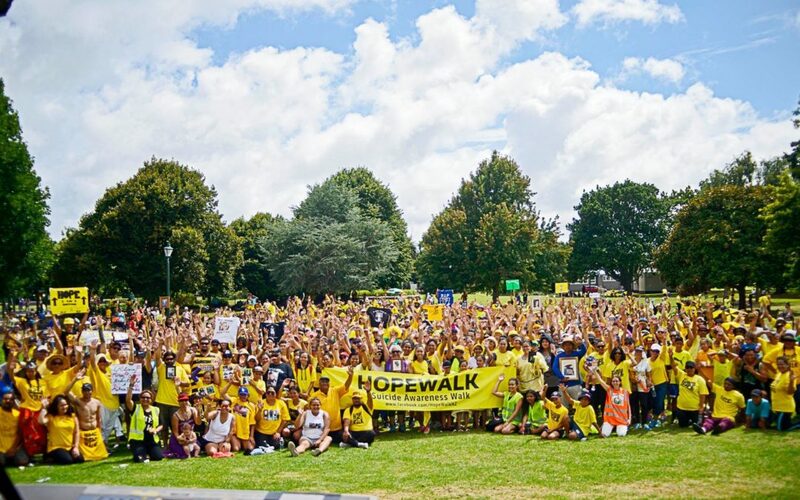 The Hope Walk, which has been done throughout New Zealand, is a collective walk through participating towns, with everyone united by the colour yellow. It has been described as a “sea of yellow” by onlookers. On September 9, the first 40 people to attend the Featherston and Masterton events will be given a free yellow Hope Walk T-shirt. All participants are asked to wear something yellow. The Featherston Hope Walk will be first up on the day starting at 10am with people meeting at the town “squircle” square. For the Masterton event, people are asked to meet at the Grace – Angel of Hope statue at Robinson’s Park at 2pm. For both events, participants will walk a circuit around town, followed by talks from Ezra Stobbart, and Toni Ryan. Ezra is a suicide survivor and endeavours to be somewhat of a mental health champion for youth. He is now working from home in suicide prevention. Toni Ryan is the mother of Sam Ryan, who took his own life in 2011 at the age of 16. She is the founder of the charity Suicide Awareness Matters. Rachel, who brought the Hope Walk event together with the help of Toni and Featherston’s Mark Shepherd said the event would be “simple” but effective. “It looks incredible when that many people are gathered with a sole purpose,” she said. There will also be children’s artwork from schools around Wairarapa featured at the events. Each child was asked to create art around the concept of hope. For more information, visit Hope Walk Wairarapa on Facebook. These 24/7 free phones are operated by trained counsellors who can help you talk through problems and identify ways of coping.